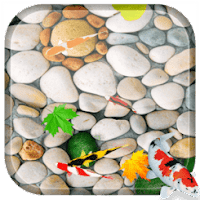 Here is fully 3D Fish Aquarium representing beautiful fishes roaming around water tank and floating petals and leaf on water making it awesome looks. Use finger gestures to create stunning, velvet smooth water ripples and water waves or choose shadow option to watch fish shadow on water. Install this romantic, beautiful & attractive wallpaper having realistic movements as appears in 3D world. Home Screen > Long tap for menu > Wallpapers > Live Wallpapers > Select Live wallpaper. Many fishes look attractive due their body colors and feathers. They look stylish and can definitely increase the beauty of any place.In an aquarium several types of fishes are left in a transparent tank of glass. Many tanks have a provision of colorful lights inside. These lights increase the beauty of the tank. Watch adorable koi fish happily exploring your aquarium and touch to water make fish angry and run away. -> Fully 3D Live Wallpaper. -> 3D rendering to save battery. We are very sophisticated and dedicated towards the quality of our Live Wallpapers.Please feel free to writes us feedback or appreciations or even criticism with a short description and don’t forget to rate this.